Situated in the south western corner of Cuba is the area known as Cayo Largo. Cayo Largo owes its name to its elongated shape and Christopher Columbus landed on it in 1494 during his second voyage to Cuba. Located in the Canarreos archipelago, it is 177km from Havana City and has 27km of cool, fine-grain, white, sandy beaches. It has coral reefs and is complemented by numerous and varied species of flora and fauna, among them iguanas, pelicans and turtles. The Sol Cayo Largo is a large resort-style and all-inclusive hotel that has comfortable accommodation and enough activities to keep any non-fisher amused during the course of a week. Cayo Largo is easy to access with a short flight from Havana. Bonefish are the most prodigious and popular of the flat species. The average weight is about 6lbs but bigger fish are regularly caught, especially in the winter months. Fishing is either from the skiff or by wading. 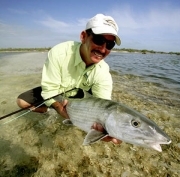 While wading the vast stretches of firm sand flats, there is nothing more exciting than catching a tailing bonefish. Tarpon rate as the strongest, most acrobatic and most exciting saltwater species on the fly, and even juvenile fish will put your fishing skills to the test. A large number of tarpon are resident year-round in the Cayo Largo tidal channels and the flats with migrating fish showing up between April and August. Their average weight is from 15 to 30lbs but fish up to 120lbs may be found. They are in the area all year long, but tarpon over 50lbs are usually found from March to August. There are many permit in Cayo Largo, and they live up to their reputation of being the most frustrating fish of the flats. Lots of skill and patience are required, but a fair number of grand slams have been achieved by many anglers. Other species that might be encountered include jack crevalle, barracuda and cubera snapper. The Sol Cayo Largo is a large resort-style and all-inclusive hotel. It has approximately 300 air-conditioned rooms all with ensuite bathrooms. It is set on a beautiful beach and is an ideal choice for someone travelling with a non-fisher. The hotel provides a broad array of services and attractions. There is a diving school nearby, a watersports centre for non-motorised watersports, a health centre with gym, two tennis courts and bicycles. There are three restaurants and you can dine in all three. It is the place to go if you want to fish and must keep a non-fisher happy. Land packages are from 4,900-6,700 Euros per fisher and from 1,410-2,070 Euros for a non fisher for a weeks fishing package (2 nights Havana and 7 nights Cayo Largo).